Greens of your choice – spinach, broccoli, napa cabbage, bok choy, etc. Instructions: Use your knife’s flat end (butcher knife being easiest) and smash the garlics instead of cutting or mincing the garlic. This is so we can extract garlic taste and yet easily take out the garlic if you don’t like eating garlic. The garlic doesn’t need to be too mashed but we need the cloves opened so it can infuse with the oil for taste. Now heat up your pan or wok and turn the heat on high, put the oil and garlic in until it starts sizzling. Now put in your washed greens, 1 tablespoon of water and put on the lid to the pan for 1 minute (it’ll steam). Then lift the lid and start stir frying for another 30 seconds until the veges are still crisp but yet done. Now sprinkle sea salt on top, lightly mix and voila! You’re done! Note: Softer veges like spinach doesn’t need time for the lid to be put on to steam. 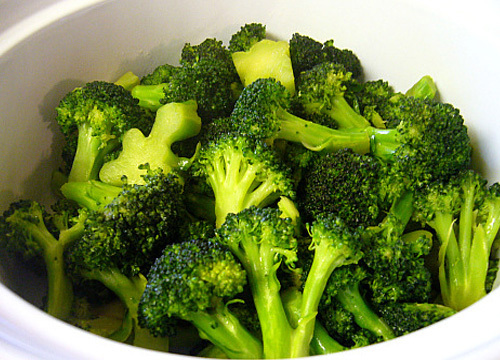 Tougher veges such as broccoli do very well with just a minute of steaming before stir fry. Enjoy! This entry was posted in General, Health Foods and tagged Diet, diet plans, Endometrioma, Endometriosis, Endometriosis Diet, health foods, homeopathic diet, homeopathic remedies. Bookmark the permalink. Can you add this recipe to brown rice or something or just the green veggies are important?